The AFMG 50 will deliver high production output giving you higher profits at a price you can afford. It is ergonomically designed to offer you ease of loading, operation and cleaning. 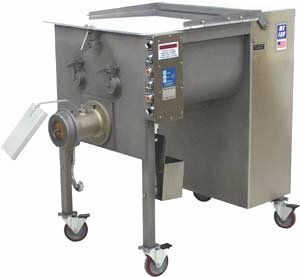 This unit comes standard with a stainless steel bowl, ring, auger, and an independent direct drive on mixing and grinder operations. Combine all the advantages of this unit, and it is clear that the AFMG 50 Mixer/Grinder is your answer to getting the biggest return on your small investment. 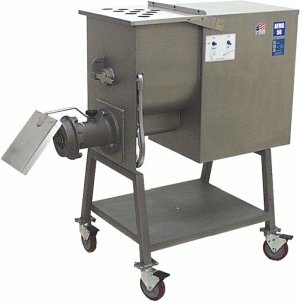 Perfect for supermarkets, small processors, butchers, and restaurants. Nothing on the market comes close to our design, output, or price!! 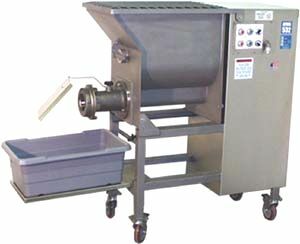 Optional stainless steel cart, single tub dolly and hopper funnel are available. You will love the AFMG 532 mixer/grinder. It is the most reliable and easy to use mixer/grinder on the market. It has a direct drive, no belts or chains to maintain or replace. Easy to remove paddle. Tilt hopper for easy cleaning. Two position tray, bottom position for lugger, top position for rosettes. Forward and reverse mixing. Cling free paddle design. Slide out control panel, for easy service. Control panel can be mounted on either side of machine. Number 32 grinding head. Internal safety switch. Includes foot control and splash guard. Construction Heavy duty stainless steel including head assembly, removable paddle, S/S hopper cover with safety lockout, adjustable shelf.